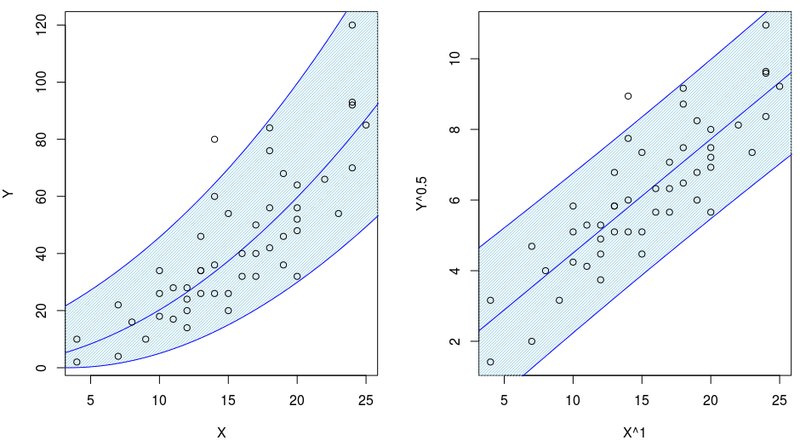 When discussing transformations in regression models, I usually briefly introduce the Box-Cox transform (see e.g. an old post on that topic) and I also mention local regressions and nonparametric estimators (see e.g. another post). But while I was working on my ACT6420 course (on predictive modeling, which is a VEE for the SOA), I read something about a “Ladder of Powers Rule” also called “Tukey and Mosteller’s Bulging Rule“. To be honest, I never heard about this rule before. But that won’t be the first time I learn something while working on my notes for a course ! 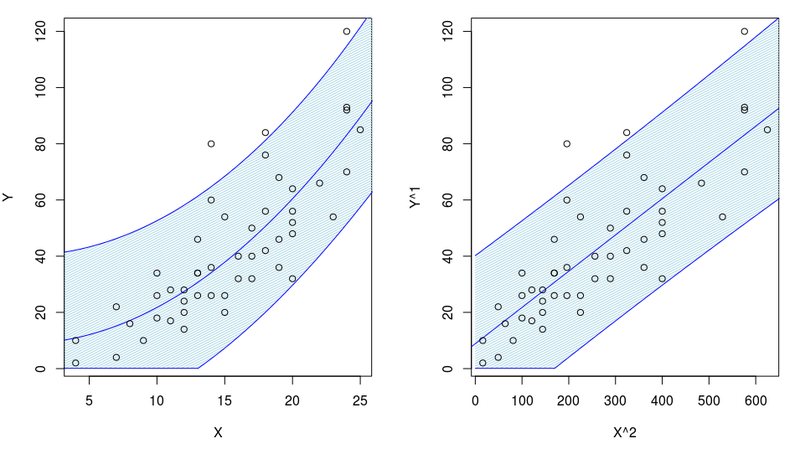 It is also possible to consider some polynomial regression. 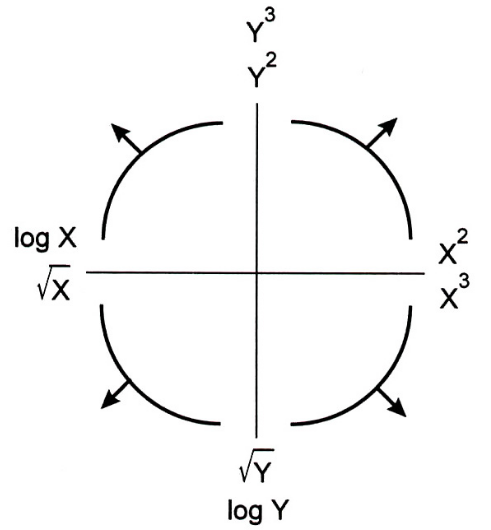 The “Tukey and Mosteller’s Bulging Rule” is based on the following figure. for some (positive) parameters and . 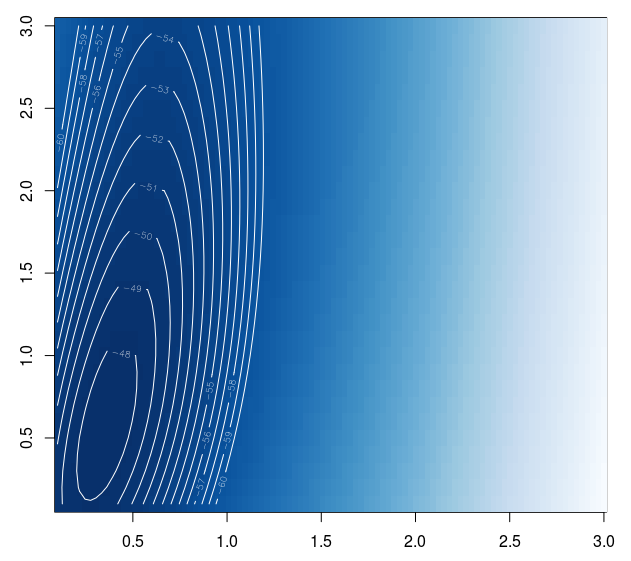 Depending on the shape of the regression function (the four curves mentioned on the graph above, in the four quadrant) different powers will be considered. where and are both larger than 1. 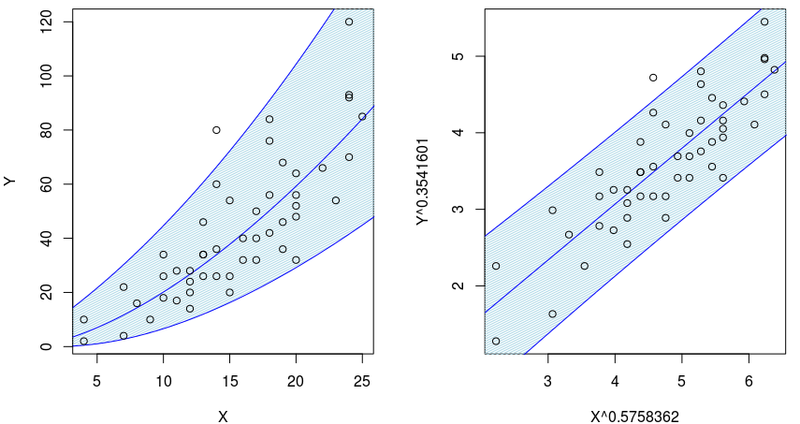 And the larger and/or , the more convex the regression curve. Let us visualize that double transformation on a dataset, say the cars dataset. 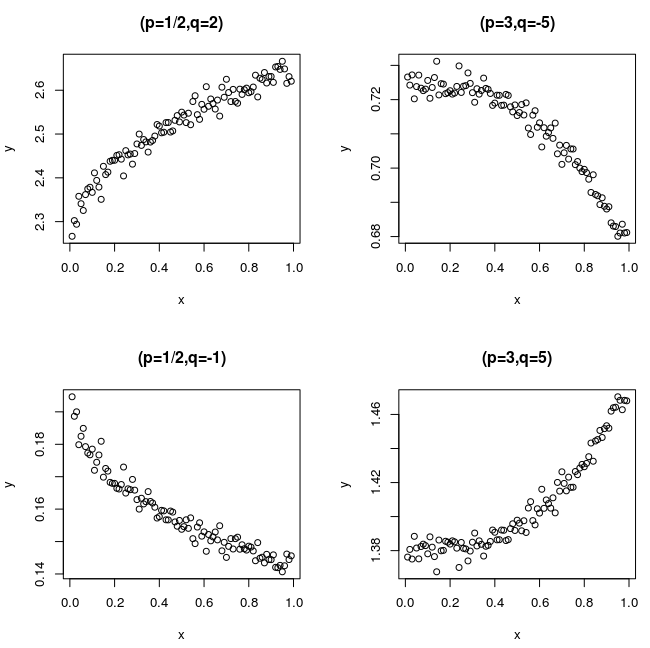 On the left, we have the original dataset, and on the right, the transformed one, , with two possible transformations. Here, we did only consider the square of the speed of the car (and only one component was transformed, here). On that transformed dataset, we run a standard linear regression. We add, here, a confidence tube. And then, we consider the inverse transformation of the prediction. This line is plotted on the left. The problem is that it should not be considered as our optimal prediction, since it is clearly biased because . But quantiles associated with a monotone transformation are the transformed quantiles. So confidence tubes can still be considered as confidence tubes.